New Sun Rising is partnering with the Etna Economic Development Corporation, Sharpsburg Neighborhood Organization, and sustainable architecture and consulting firm evolveEA to promote coordinated sustainable community development throughout the Boroughs of Millvale, Etna and Sharpsburg. With over 10,000 residents combined, these Allegheny River towns are building on a strong collaborative history to promote sustainable community development through the shared lenses of: Food, Water, Energy, Air Quality, Mobility, and Equity. The Triboro Ecodistrict is an initiative of New Sun Rising. 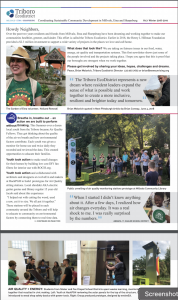 Read all about the Triboro in the newsletter below! (5) Mobility: Supporting adoption of Complete Streets policy and practice. Advocate for and increase multi modal connectivity. Since 2012, Millvale stakeholders have worked with evolveEA in launching and growing the Millvale Ecodistrict Pivot Plan. Now in its second iteration after 5 years of efforts, the Millvale stakeholders have made significant progress implementing the plan while gaining regional and national recognition including a recent American Planning Association (APA) National Planning Achievement Award, and another APA Sustainable Communities Award for Sustainable Planning. The Triboro Ecodistrict leverages assets created during this work in Millvale, and those existing assets within Etna and Sharpsburg to collaboratively grow partnerships and impacts together with neighboring Allegheny River towns.